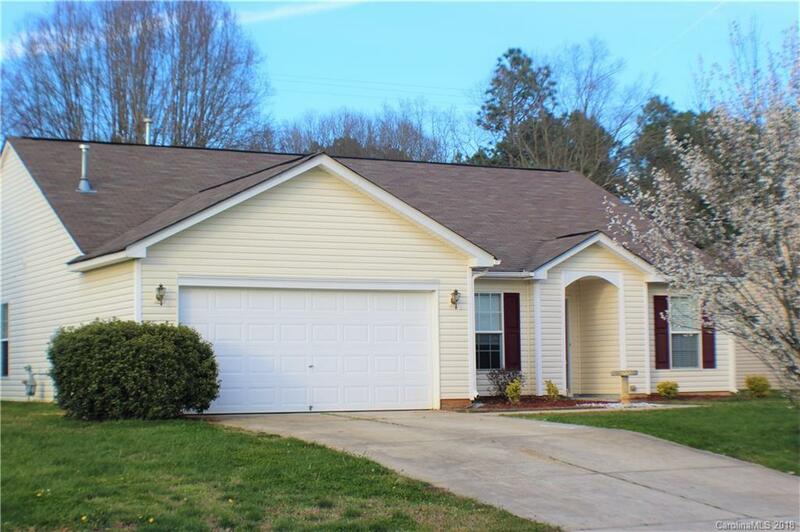 Welcome home to this updated one-story home located in Linwood Farms, a desirable Pool Community in the Mooresville Graded School District. Dramatic Vaulted Ceilings throughout Great-room, Kitchen Breakfast & Foyer areas with laminate floors & fresh paint. Formal Dining Room with laminate floors could be used as an office. Kitchen has NEW Granite Counters & pass through Bar Top, deep under mount sink, new one piece pull down faucet, Pantry, Black Built in Microwave, Range, Dishwasher and Samsung Bottom Freezer Refrigerator included. Master Bedroom has vaulted ceilings, NEW Carpet, large walk-in closet & en-suite bath with dual vanity, linen closet, window & NEW vinyl floors. Hallway, Full Hall Bath & Laundry with NEW vinyl floors. 2 Coat closets- one in Entry & Laundry Room. Sliding door to concrete patio & back yard. 2 Car Garage with opener. Seller providing a 13 Month HWA Diamond Plan Home Warranty. Location is Eligible for 100% USDA Rural Development Financing.